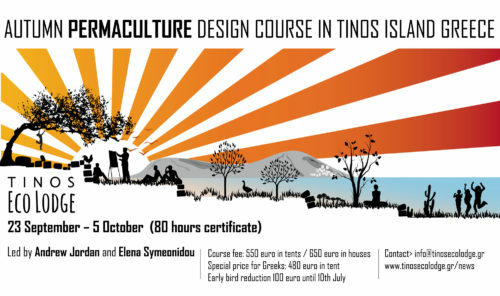 We are excited to announce the second FULL PERMACULTURE DESIGN COURSE (PDC) that will be hosted in Tinos Eco-lodge with two knowledgeable teachers Andrew Jordan from Ireland and Elena Symeonidou from Greece. 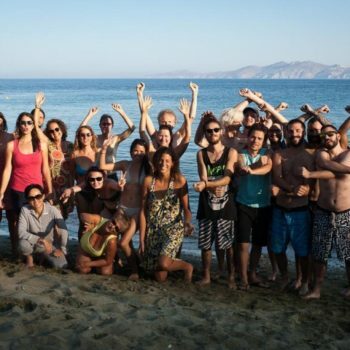 Andrew and Elena aim at inspiring students with their own very real examples of transforming their lives with permaculture in a contemporary context. Having worked in a broad spectrum of climate and social conditions, they will share with their students the thrills but also the challenges they faced. 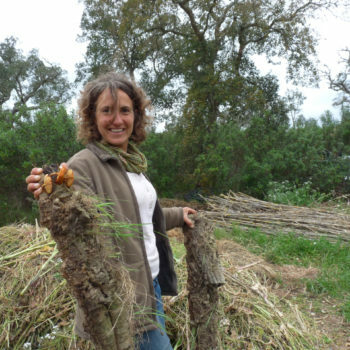 Oftentimes permaculture is being presented as a panacea for world problems and the road to resilience and abundance is depicted as straightforward and easy. Andrew and Elena will challenge this notion and try to prepare their students in a realistic manner for their own fascinating journey towards change. 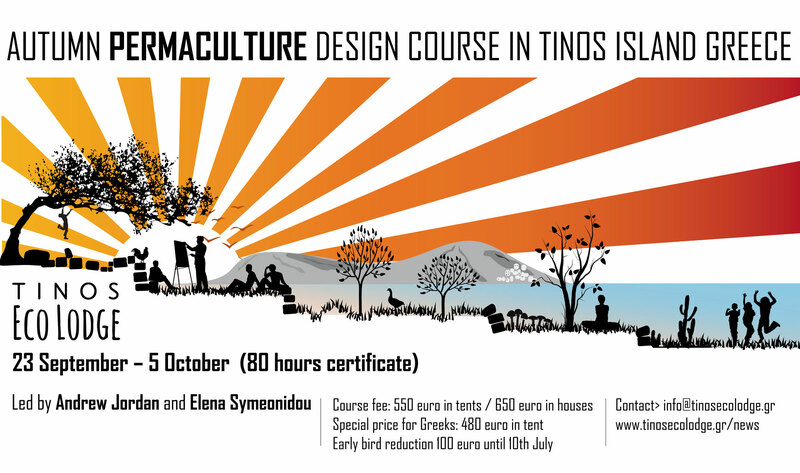 Nikos will share his hands-on experience of building the ecolodge and designing the energy, water, plant and waste systems. We will have the rare opportunity to discuss and elaborate on Nikos’ and Marilia’s choices on different aspects of their project, reflect on the challenges, opportunities and limitations. Anyone who wants to bring a big change in his life and gain a thorough understanding of how we can use our natural environment sustainably is welcome to participate. There is no need of previous knowledge of the subject. 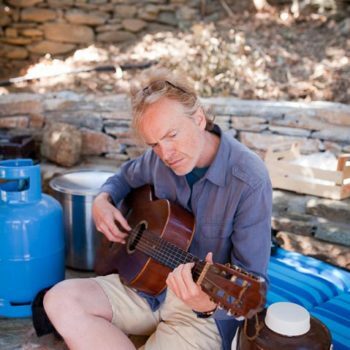 Andrew Jordan: Andrew was first introduced to permaculture while volunteering on a farm in Australia. 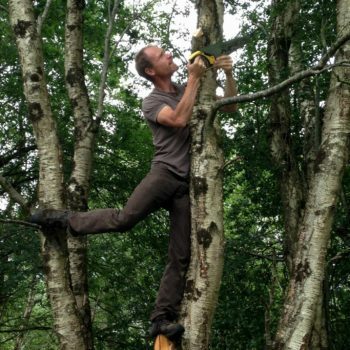 Bitten by the bug, he proceeded to track down as many permaculture people and projects as possible, learning the principles and practice through direct experience. His work led him to realise a particular passion for agroforestry, natural building, and botanical medicine. 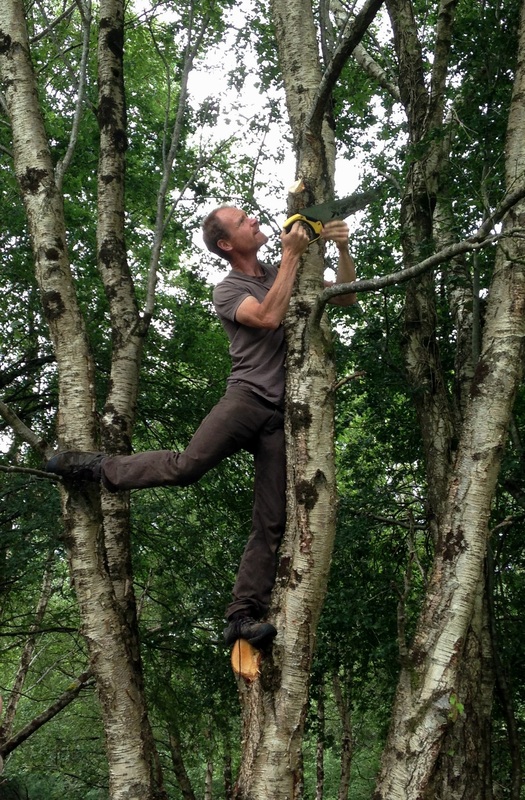 In pursuit of working models and mentors, Andrew spent almost ten years working on permaculture farms and communities around the planet, developing new skills and knowledge, centred around; food production, land management, shelter building, energy systems and the design process. 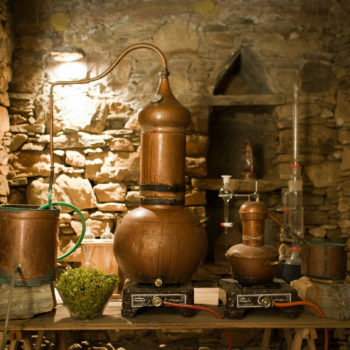 Recently returning to his homeland of Ireland, Andrew has focused on small scale bio-intensive food production, following biodynamic principles. He currently manages the gardens at Sonairte, Ireland’s National Ecology Centre, where he and his team produce a wide range of fruits, vegetables and animal products for the local community. 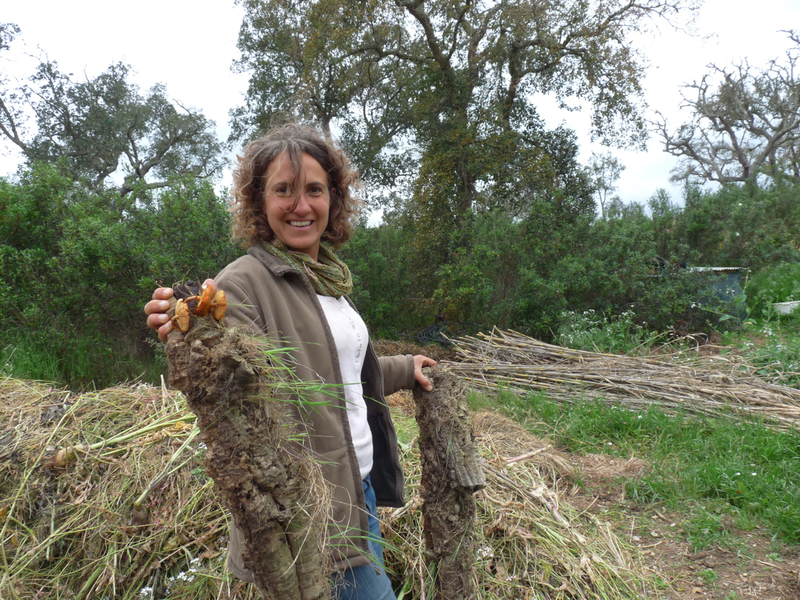 He also gives courses on growing, permaculture and natural building. 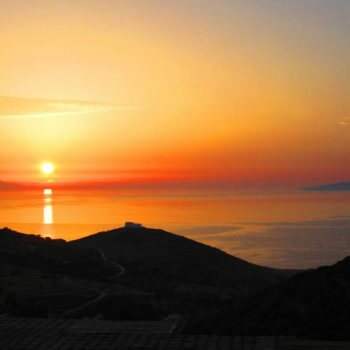 Tinos Ecolodge is situated in a beautiful island setting with great sea views and sunrise from the sea, traditional terraced landscape, with a nearby stream and lots of old oak trees to camp under. There is also limited space in the 2 lodges which can host up to 8 people. There will be a communal outdoor kitchen were we will eat all together 3 meals per day, and outdoor showers and compost toilets for those who camp. Max number of participants is 20 people. 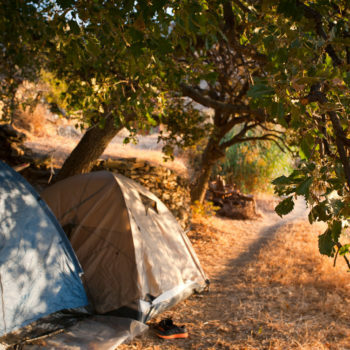 Cost: early bird prices 450euro/tents and 550euro/houses if booked until the 10th of July, after that 550euro/tents and 650euro/houses. 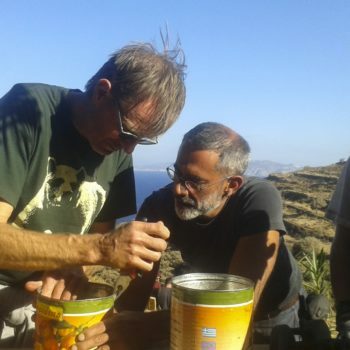 There will be also a special price for Greek participants which are suffering from the economic crisis at 380euro early bird – 480euro only for tents. For booking a place a deposit of €100 must be paid on application, full balance to be paid upon arrival. Please download the application form below and send it to Marilia or mail her if you need any further information and details about the course.